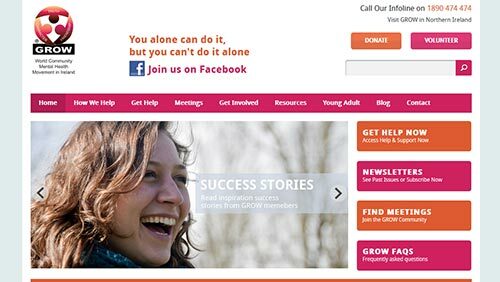 GROW, Ireland's largest mutual help organisation was founded in Australia in 1957 by a group of people suffering from mental health problems. In Ireland since 1969, it has a network of 145 groups nationwide. GROW offers a program of prevention, for people who feel anxious, stressed out and fear a breakdown, rehabilitation after breakdown for people who have been hospitalized, and personal development for those who need to improve coping skills, shyness, social phobias etc. Research shows that the support GROW gives to people in distress enables them to perform better at work and to cope better with life in general. GROW support meetings take place weekly. Membership is free, confidential and open to all. Groups are small and personal. No referral or introduction necessary, just come along.